a glass top and hinged lid as well as a keyed lock. 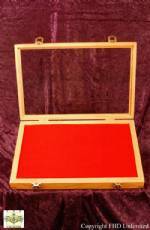 Case measures:10"High x 18" Wide x 3" Deep Display area measures 8 1/4" x 16 1/4". This beautiful case doubles as a shadow box!! (*Note - This case is not designed for security. )These cases are built at the time of purchase and can take up to 4 weeks to receive. Got this case to display a pistol handed down through my family. Was really pleased with the case and how the pistol looks in it.